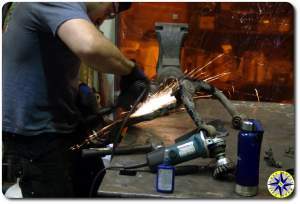 Since we look for places that set up situations where all those circumstances come together, we thought we would see about reinforcing the knuckle spindle. We found that Total Chaos now offers a weld on 1/8” laser cut spindle gusset intended to reinforce the spindles where they bend. These gussets can be installed with aftermarket upper control arms (UCA) but are not compatible with stock upper control arms. Just another reason for a UCA upgrade. 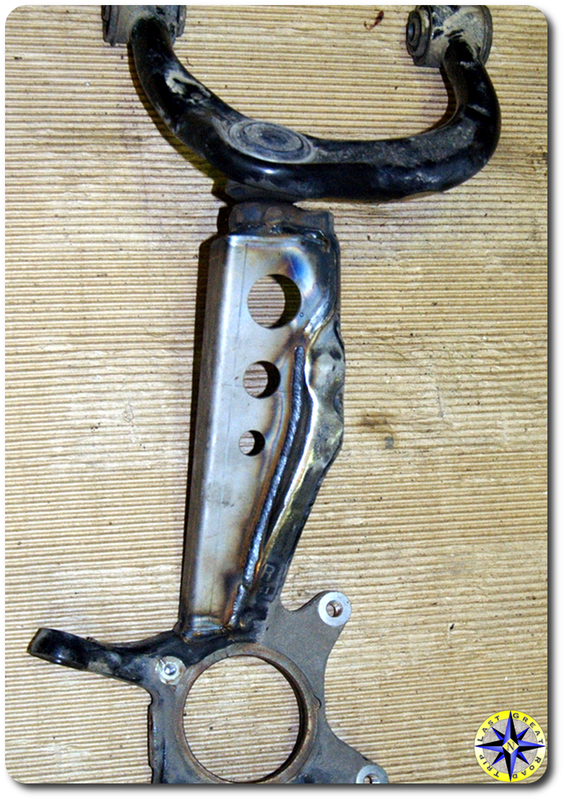 The gussets also dictate that you run without a sway bar. On the road the sway bar helps eliminate body roll and keep the wheels planted on the ground at high speeds or in emergency maneuvers. Off-road the sway bar can limit the amount of flex your rig is capable as it tries to balance out the movement. 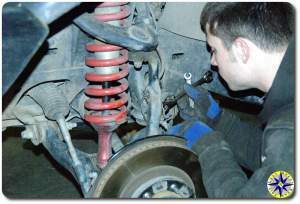 We are running Sway-A-Way coil overs upfront and use the rig as for daily driving. Luckily the SAWs are plenty capable of preventing body roll on their own and removing the sway bar should not impact on-road performance. If you’re running a daily driver with other coil overs, test drive your rig without a sway bar before committing to permanent removal. We headed down to Metal Tech, to have the guys help us out with this mod. Mark and LT really know Toyota’s and have performed several of these mods, including one on their own shop FJ after bending a spindle during a hard day of wheeling. The first thing the guys did was pull apart the rig, removing the sway bar, breaks, hubs, seals, lines, and sensors in order to pull off the knuckle. Be gentle with the ABS sensor that plugs into the front of the knuckle, you don’t want to set off all the angry dash lights when you bolt it all back up. 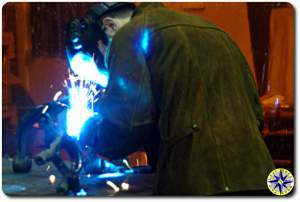 Also before you start be sure to have new seals and hub covers on hand since they will take a beating during the disassemble process and are hardly worth spending the time needed to clean and repair. After giving the metal a chance to cool down it was time to pull out the one universal tool every wheeling back yard or pro mechanic must have. Rattle Can paint! You have to love that can of Rustolium sitting on the shelf that keeps little spots looking good and stays off the rust as we through the rig into all the nasty stuff that convert perfectly good steel into weak brittle bits. With all the fab work done, it was time to button it all up and reassemble the suspension. That means the new UCAs go into place along with bolting on the hubs and seals, tie rods, brakes, lines and of course bleeding the break lines. The shield that holds the ABS sensor cable out of the way will take a little grinding to ensure it fits up against the knuckle and gusset. After getting it all put back together it was a quick run to the hot rod shop down the road for an alignment and the hole thing was done in no time. With all the experience the guys at Metal Tech have, this mod was easy. 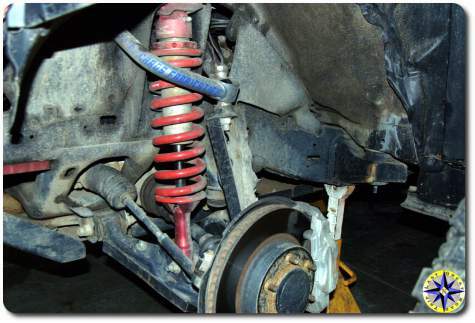 So how was the handling on the road without a sway bar? With Sway-A-Way coil overs, I did not notice a change in handling. That was even after taking the twisty back roads from Newberg to Portland, the hole time testing how fast I could comfortably go into and out of the turns.